Astronaut Patrick G. Forrester, NASA mission specialist, sits for an official photo portrait. NAME: Patrick G.Forrester (Colonel, U.S. Army, Retired). PERSONAL DATA: Born March 31, 1957 in El Paso, Texas. Married to the former Diana Lynn Morris of Springfield, Virginia. They havetwo children. He enjoys baseball and running. His parents, Colonel (ret. )Redmond V. and Patsy L. Forrester, reside in Fort Walton Beach, Florida. Her father, Colonel (ret.) Lurie J. Morris, resides in Jacksonville, Florida. Her mother, Bettye Morris, is deceased. EDUCATION: Graduated from West SpringfieldHigh School, Springfield, Virginia in 1975; received a bachelor of sciencedegree in applied sciences and engineering from the United States Military Academy, West Point, New York, in 1979, and a master of science degree in mechanicaland aerospace engineering from the University of Virginia in 1989. AWARDS: Defense Superior Service Medal;Legion of Merit; Meritorious Service Medal (2nd Oak Leaf Cluster); ArmyCommendation Medal; Army Achievement Medal; National Defense Service Medal;Expert Infantryman Badge. SPECIAL HONORS: The Jack Northrop Award, Society ofExperimental Test Pilots (1996). The Lyndon B. Johnson Space Center Certificate of Commendation (1995). NASA Space Flight Medal (2001). The Order of St.Michael (2001). EXPERIENCE: Forrester graduated from West Point in June 1979 and was commissioned as a Second Lieutenant in the U.S. Army. Heentered the U.S. Army Aviation School in 1979 and was designated an Armyaviator in September 1980. He was subsequently assigned as an instructor pilotat the Aviation School and as the Aide-de-Camp to the Deputy Commanding Generalof the U.S. Army Aviation Center. In 1984, he was assigned to the 25th InfantryDivision (Light), Schofield Barracks, Hawaii, where he served as a platoonleader, aviation company operations officer, and an assault helicopterbattalion operations officer. After completing a Master of Science degree atthe University of Virginia in 1989, he was assigned as a flight test engineerand as the research and development coordinator with the Army Aviation EngineeringFlight Activity at Edwards Air Force Base, California. In June 1992, he graduated from the U.S. Naval TestPilot School and was designated an experimental test pilot. In 1992, he wasassigned as an engineering test pilot at the U.S. Army Aviation Technical TestCenter, Fort Rucker, Alabama. Other military schools include the ArmyParachutist Course, U.S. Army Ranger School, the Combined Arms Services Staff School, and the Command and General Staff College. A Master Army Aviator, he has logged over 4000 hoursin over 50 different aircraft. NASA EXPERIENCE: Forrester was assigned to NASA atthe Johnson Space Center as an aerospace engineer in July 1993. 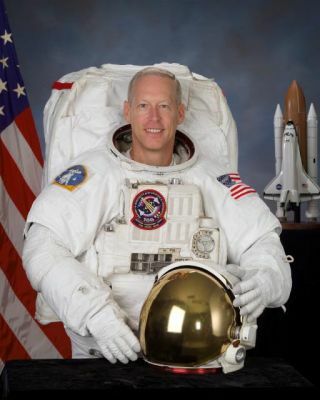 His technical assignments within the Astronaut Office OperationsDevelopment Branch have included: flight software testing with the Shuttle Avionics IntegrationLaboratory (SAIL); astronaut office representative for Landing/Rollout issues,Multi-function Electronic Display System ( MEDS) upgrade of the Orbiter fleet,and the Portable In-flight Landing Operations Trainer (PILOT). He has alsoserved as the crew representative for robotics development for the International SpaceStation. Forrester was selected as an astronaut candidate byNASA in May 1996. Having completed two years of training and evaluation, he isqualified for flight assignment as a mission specialist. Initially, Forresterwas assigned to duties at the Kennedy Space Center as a member of the astronautsupport team, responsible for Shuttle prelaunch vehicle checkout, crew ingressand strap-in, and crew egress after landing. He next served as the technicalassistant to the Director, Flight Crew Operations. Following that, Forrester served as the Shuttletraining and on-board crew procedures representative. He has also served as aCAPCOM for both ISS and shuttle missions. Forrester flew on STS-105(2001). He has logged over 285 hours in space, including two spacewalkstotaling 11 hours and 45 minutes of EVA time. Currently, he is assigned to the crewof STS-117. SPACE FLIGHT EXPERIENCE: STS-105Discovery ( Aug 10-22, 2001) was the 11th mission to the International SpaceStation. While at the orbital outpost, the STS-105 crewdelivered the Expedition-3 crew, attached the Leonardo Multi-Purpose Logistics Module(MPLM), and transferred over 2.7 metric tons of supplies and equipment to thestation. During the mission, Pat Forrester and Dan Barryperformed twospacewalks totaling 11 hours and 45 minutes of EVA time. Forrester servedas the prime robotics operator to install the MPLM. STS-105 also brought homethe Expedition-2crew. The STS-105 mission was accomplished in 186 orbits of the Earth,traveling over 4.9 million miles in 285 hours and 13 minutes.